Walk to and swim in Wellfleet’s pristine sandy bottom kettle ponds. Spend your time in a warm, welcoming, whimsical, contemporary home on quiet cul-de-sac. It is a sunny, 3 bedroom, 1 1/2 baths, outdoor shower, fully equipped house with microwave, w/d, dishwasher, ipod/nano CD stereo, free WIFI, VCR/DVD, Tempurpedic double bed, deck furniture, books, games, beach chairs/umbrella, BBQ. Walk to town center on sandy paths along the harbor. Your vacation home is 1.5 miles from protected ocean beaches on 26 miles of National Seashore. You are less than a 15- minute drive to Provincetown. Our guestbook points the way to interesting and fun things to do. Sailing, kayaking, beaching at ponds, bay or ocean, movies (one of the few remaining drive-in theaters in the country) and theater in Wellfleet, Provincetown, Orleans, golfing, tennis, building a fire or simply walking the beaches in moonlight, clamming, fishing, surfing/windsurfing, boogie boarding, whale watching, hiking along the dunes or in conservation land or spending time in the Audubon Wildlife Refuge, gallery hopping, eating at salty dog or upscale restaurants, reading or sipping cocktails on the deck, watching a surprising variety of birds at the feeder. All this and and more await you! Location, Location, Location. It's so much fun to walk into Wellfleet Center along the paths and overlook the harbor in one direction. In the other direction you can walk through the national seashore woods and go to 4 beautiful sandy bottom wonderfully swimable ponds. A short drive will also take you. Located on the ocean side it is an easy 2 mile bike ride to one the beach or ride along Ocean View Drive and visit many others. In the mornings I awake, take my coffee , go to La Count Hallow beach and watch the surfers and the seals! I fell in love with the layout of this house. It is designed with lots of light in mind and fits in with the woods outside. 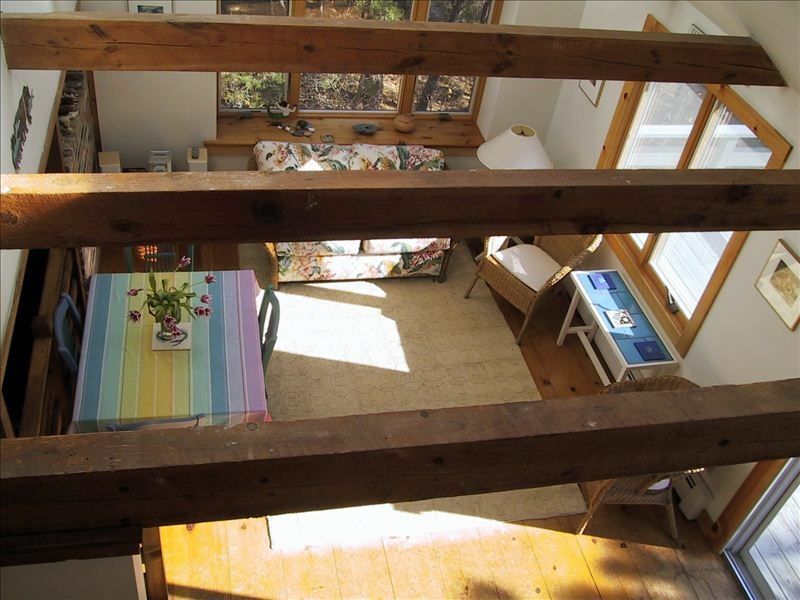 The multi-level feel of the house is open, bright and warm. I love taking an outdoor shower, looking into the woods, seeing and hearing the brightly colored gold-finches, sweet sweet chickadees and other birds. Wooded area in back of house. Walking trails to the 3 wonderful Wellfleet ponds. Wellfleet is an historic, quaint village filled with restaurants, art galleries, boutiques, farmer market, a small market and a top library. Take a stroll through the town to the harbor. Many books and the Wellfleet library is about a 5 minute drive. Selection of comedies, dramas and documentaries Wellfleet Library has a free great selection also. Giant flea market with international vendors, Drive-in Theater, Audubon wildlife refuge, 22 mile beautiful paved bicycle path from Wellfleet to Dennis, going through woods, state park, ponds, affording open vistas. Art galleries, nearby tennis courts, plentiful cultural offerings such as theater, concerts and readings. Wellfleet has an award-winning public library that also hosts readings, storytelling, lectures and recitals. Security Deposit of $300.00--I have always been able to return the security deposit to renters. There is a 12.45% tax which includes state, local and water. This tax is payable directly to me. VRBO/homeaway does not include it in their total fee.